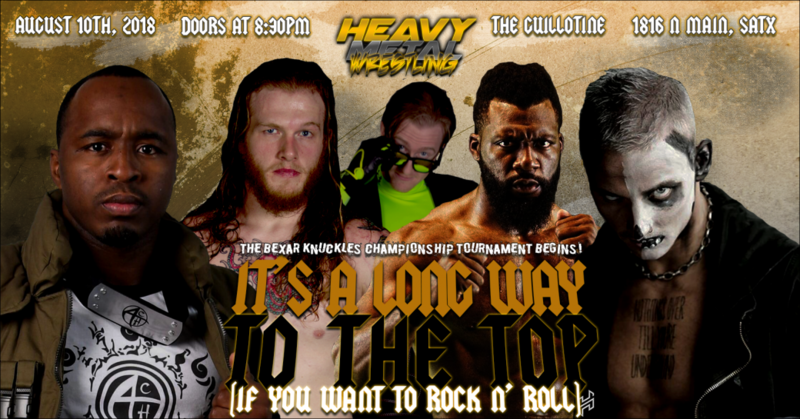 Heavy Metal Wrestling returns to The Guillotine on August 10th, 2018 for the start of the BEXAR KNUCKLES CHAMPIONSHIP TOURNAMENT and IT’S A LONG WAY TO THE TOP! The Bexar Knuckles Championship will be the first Championship introduced to Heavy Metal Wrestling, so it’s easy to see why talent from across the world are making their way to San Antonio on August 10th. Stay tuned for a full bracket and matches that will be taking place on August 10th! They’ll be announced leading up to the event. Live music! Full bar with great specials! Awesome food truck! Killer wrestling! ALL FOR JUST $10! You won’t find an experience like Heavy Metal Wrestling anywhere else.